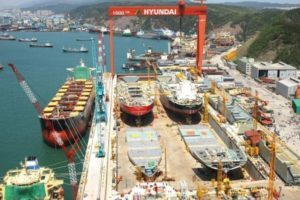 Hyundai Heavy Industries and Lloyd’s Register are working on joint design of dry-cargo ships with a deadweight of 180,000 DWT, announced the both companies at the Nor-Shipping 2017 trade show. These projects will meet the latest market needs, using the LNG as marine fuel. The vessels optimal design for operating on short and medium-duty bulk carriers (like Australia-Asia) and long-distance routes (like Brazil-Asia) in accordance with agreed common IACS Harmonised Common Structural Rules (HCSR). The both companies will present their projects soon, but currently did not revealed more specific details. Hyundai Heavy Industries Co (HHI) is the world’s largest shipbuilding industrial company, which is located in Ulsan, South Korea. The Group has seven business units: shipbuilding, marine and engineering projects, industrial production, the creation of engines and machinery, electrical systems, construction equipment and the development of clean energy sources. Founded in 1760 in the UK, as a voluntary association of shipowners, shipbuilders, manufacturers of ship mechanisms and insurance companies, Lloyd’s Register is today the largest classification society, as well as company providing engineering and technical services to sea vessels. Lloyd’s Register is a member of the Lloyd’s Register Foundation, which supports various scientific and technical research and educational projects. The society’s goals are to improve the safety of life, property and the environment, by assisting clients in the construction and operation of vulnerable facilities and infrastructure. Lloyd’s Register operates in many sectors of the economy, has a staff of 9 thousand people in 78 countries.